The movements of troops from the Easter front had not just brought more men to the West, it had also freed up some of Germany's best military leaders to come west to lead the new attack and they would play a pivotal role in the March actions. They would be placed under the command of Crown Prince Rupprecht of Bavaria and Crown Prince Wilhelm. 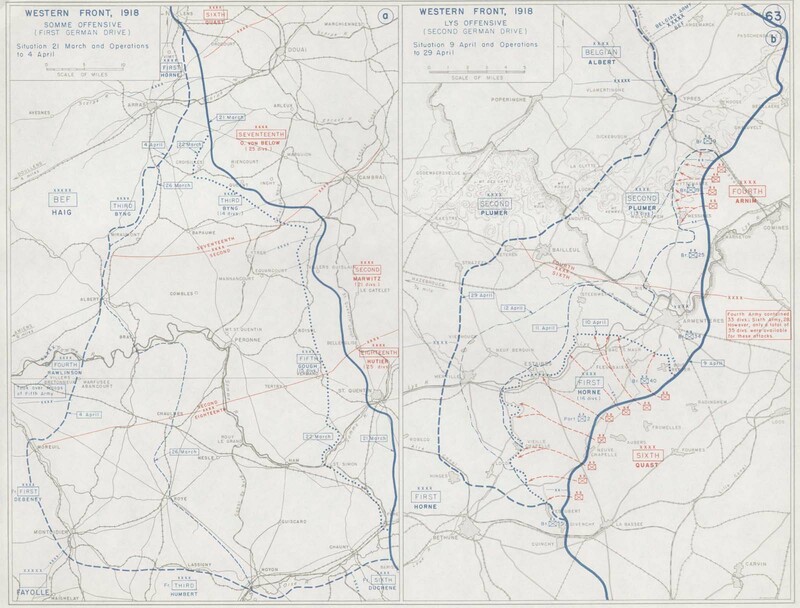 It would have made perfect sense to let Rupprecht command the entire offensive, as he had control over the entire area of the front where it would take place. However, Ludendorff decided against this for several reasons. The first was because it allowed Ludendorff to exercise more control over the events since it required coordination between the two Army Groups. The second reason was because it allowed the Kaiser's son to participate more directly in what was supported to be the great war winning offensive, or at least the start of it. To allow for this to happen the boundary between the two army groups was brought north, and Wilhelms front would now include much of the area that had been taken over by the British from the French. The armies would be arranged in this way, in the north, commanded by Rupprecht would be General von Below's army. His orders were to break though in the direction of Bapaume. to his left was Geneeral von der Marwitzh, hid goal was to breakthrough towards Peronne. Once this was done both armies would swing north and roll up the British lines. To their south was General Hutier, under Crown Prince Wilhelm. This purpose was to move forward with the other armies and to guard their southern flank while they moved off north. It was envisioined that Hutier would not advance past the Crozat canal, and this would be done solely to guard the flank. This part is important, to remember this it will come int play later. As originally designed General Hutier and his 18th Army was not the primary point of effort in the attack, and while this would change after the attack began, from the start Hutier's army was always envisioned in a strictly supporting role. The area that would be fought over was bounded in the south by the wide and marshy River Oise and it would extend north to just south of the city of Arras. Beyond these features there was not much in terms of distinguishing characteristics for this area. It was mostly just flat rolling hills that continued until the land fell away into Artois and the River Scarpe in the north. The BEF had actually retreated through this area way back in 1914 on its way from Mons to the Marne, that it mattered too much at this point or that there were many British troops from that previous trip. 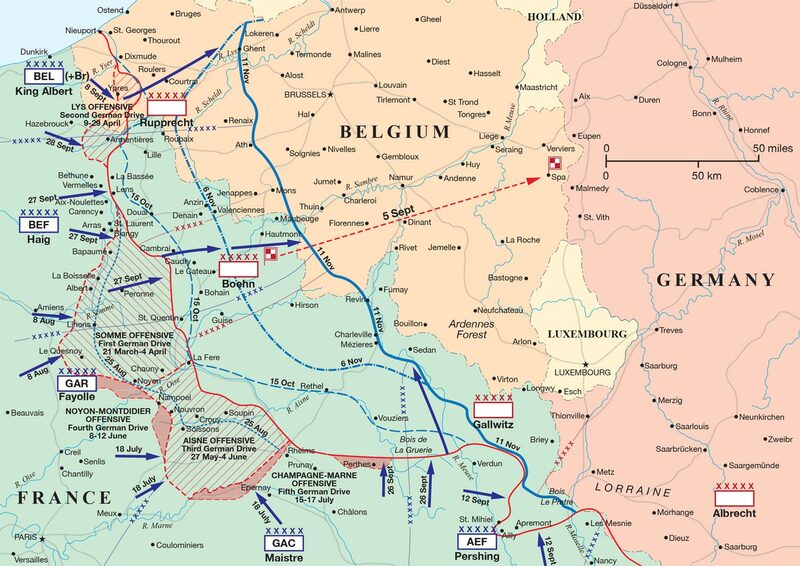 While preparing for the attack the Germans were actually surprised that the British took over some of the line that had been previously held by the French. This did not greatly concern anyone. 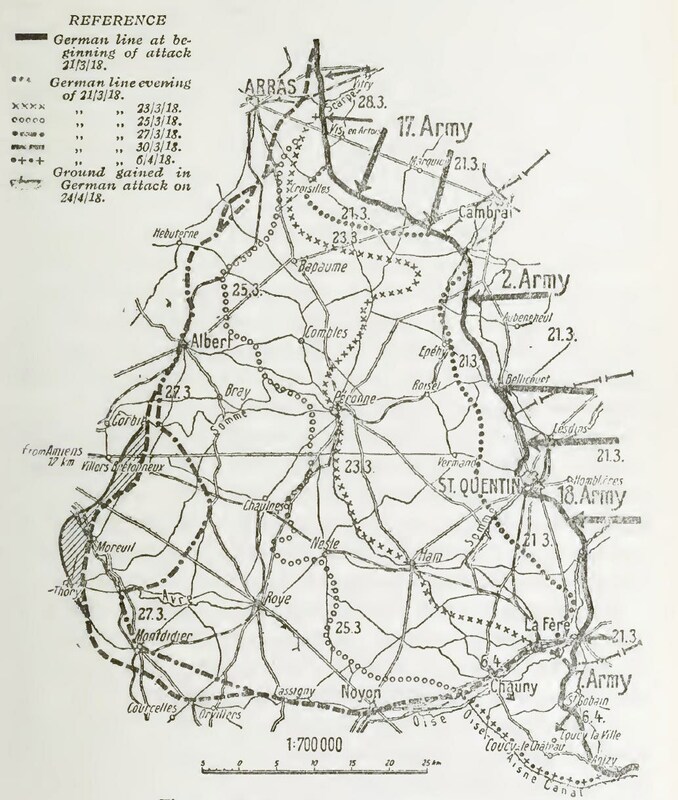 While it did slightly change what the Germans were doing, since it meant that they were not attacking the junction between the two armies but it did not change the objective which was to pull the two armies apart and cause a crisis so that they would be forced to rush in reinforcements. Along the front of the attack the exact comparison of forces differed depending on the exact area, but an example of how imbalanced it was can be seen by looking at an area of the front near the village of Queant. On this part of the battlefront the British held 2,000 yards of line with about half of a division, somewhere around 5 battalions. In front of them, even if they did not yet know it, would be 45 German battalions. This type of extreme inequality in numbers was somewhat typical along this area of rhte front from the start of the attack, which makes it pretty easy to understand how difficult it would be for the British defenders once the attack began. In the run up to the attack a lot of work had been done behind the German lines to make the attack a success. Roads and rails had been improved, bridges strengthened, all to allow for larger quantities of supplies to quickly move forward.. All the work had been done at night, and troop movements, which began in earnest during the second week of March, were also done in the darkness. To try and keep everything synchronized the Germans would use a large black ball hung from a balloon, the ball would be dropped at precisely noon then raised exactly ten minutes later, allowing the entire front to synchronize their watches every day. For a good look at what the Germans troops were most concerend about after they moved up to the front, here is Unteroffizer Friedrich Flohr "We knew that the Tommies had in their dug-outs all the good things we hadn’t – chocolate, coffee, corned beef, wine, spirits, cigars, cigarettes. How did we fare? In the morning, a hot brew supposed to be coffee but tasting of swedes, midday a thin soup of swedes or dried vegetables without any meat, sometimes a few pieces of potato; evening a brew called tea tasting of swedes. The bread was good. My age group (1897–8) got an extra thick slice daily, which was most welcome as we were always hungry. The older men didn’t mind; they understood. Jam was of very poor quality and so was the sausage, which we called rubber sausage. All the same, nobody starved to death." The Germans would, of course, be planning to use a lot of artillery in the coming attack, but they wouold be doing something a bit different with it. The artillery plan would be developed by Colonel Georg Bruchmuller, who had also arrived from the Eastern Front. He brought with him a stirling reputation for his ability to plan and coordinate artillery to create opportunities to attack. Some call him the most important individual in the entire German Army during 1918. The key to Bruchmuller's plan was his belief that the massive, and very lengthy, barrages that had been a common tactic in the West were futile. Such long preparations told the enemy exactly where you were going to attack and gave them plenty of time to prepare. Instead Bruchmuller pushed for a short, and incredibly intense, bombardment that lasted just a few hours. He would also plan for a complicated dance of shells as they were moved back and forth along the line, switching from the front lines to the reserve lines to the artillery, mixing in high explosives, shrapnel, and gas. All of this was designe dto confuse the enemy and disorient the defenders in the front lines. To accomplish all of this precise fire, while also maintaining surprise, Bruchmuller had all of his guns tested behind the front. Precise firing information about every gun would be gathered to allow them to fire, with a good amount of certaintly, on a target the first time they fired at it. When trying to plan for a bombardment including thousands of guns, being able to count on each gun to hit their targets was priceless. This type of bombardment was perfect against the strongly held lines near the front of the defenses, and the British troops there would pay dearly for holding the line. To do his work Bruchmuller would have 6473 guns, of heavy and medium varieties, at his disposal as well as 3500 trench mortars, or minenwerfer as the Germans called them, and they would be provisioned with over a million shells. These guns represented almost half of the entire strength of the German artillery in the west but because of pre-registration they were brought up at the last minute without the British having any real good idea about how many were present. Two nights before the attack the German assault troops would be moved forward, and overall troop morale was high. It certainly did not hurt that in the weeks leading up to the attack the troops had been given better, and more, rations to prepare them for the attack. One German Officer would describe the mindset of the troops as one of 'firm confidence in a good success.' As soon as it grew dark the areas behind the front were suddenly alive with masses of troops pushing forward. Because the troops were moving forward two nights before the attack all of these troops would have to spend the entirety of the 20th in shelters near the front. These came in the form of dugouts, houses, or special shelters dug just for this occasion. They were packed in these shelters, and I am sure many men were thankful when night came on the 20th and they were able to move forward once again into their jumping off positions. Here if Gefreiter Willy Adams discussing his experience on the 20th "There was a platoon of us, about twenty-five men I should say, under a Feldwebel. We were in a small underground shelter but only just below ground level. It was a very frightening time; we couldn’t leave. We tried to sleep but most of the day we were just talking nonsense, arguing a bit – not real arguments just rude jokes on each other – or just getting plain bored, but always hoping that a shell wouldn’t come through that thin roof. Toilet? You did it on a spade and then went up the steps and threw it outside. The other things we had tins for and, if you were careless, you got the contents of this back when you threw them out the top of the steps." Once this movement was done the front line trenches were packed with men, with just as much of a concentration in all the areas behind the front as well as everybody prepared to move forward. Most of the troops wouold get to their final positions aroudn 1AM where they would then wait for the artillery fire to begin. Each infantryman had been given two flasks of tea or coffee and told to make it last as long as possible, there would not be any more given before the attack began. Speaking of artillery, most of the guns were not moved up until the night before they were needed. They would find their positions marked with numbered posted behind the front with prestocked ammunition dumps nearby. They would put their complete faith in the ability of each gun to fire off the map and no registration shots were allowed. In the hours of waiting before the attack men were alone with their thoughts as Unteroffizier Erich Kubatzki describes "Nobody wants to talk, the strain is too severe. How will it go? Because of all the preparations, down to the smallest detail, none of us had earlier had any doubts concerning the High Command but now, with everybody idle and waiting, the tension was almost unbearable. Nagging doubts overcame us. There was no artillery fire from the enemy. Not even a single rifle from the trenches could be heard, only the flares from the trenches to illuminate the ground, rising high into the air, burning themselves out quickly." In the artillery they were preparing to begin their work, Leutenant der Reserve Otto Porath of the 271st Field Artillery would discuss the final preparations for his battery "All battery officers were summoned to a meeting with the group artilleyr commander. In the group commander's dugout we received a large number of written orders, as well as the plans and objectives of our attack. Our watches were synchronized. All of us rushed back to our batteries, because only a short time was left to do a lot of work that night. All targets were mapped on our maps, but there was no time to otain the correct ranging distances to the various targets. That was a risk we had to accept. We aldo did not know what the weather would be like in the mroning, nor waht the temperatures would be. We were through with our calculations at 2AM." The bombardment would begin at 4:20AM. In some sectors one heavy gun would fire the first round as a single for the rest of the guns to open up, in other areas large rockets were used to signal the order to open fire. In all cases every gun began firing for those first 20 minutes they fired at maximum possible speed. After 20 minutes some of the guns and mortars slowed their fire while the larger guns continued. They would continue a steady pace of fire for 5 hours. During this time they would fire a mixture of shells on a mixture of targets based on Bruchmuller's formula. Some of these shells were also gas shells with two type of gas used. The first was tear gas in the hope that it would penetrate the British gas masks and irritate the soldiers wearing them, making the soldiers want to take their masks off. If they did this they would inhale the second kind of gas which was a deadly mixture of phosgene and chlorine. The heaviest of the gas fire fell on the British artillery positions, with as many as four gas shells for every high explosive fired on the British guns, along the rest of the front it was more of a 50/50 affair. The entire goal of so much gas being fired on the artillery was to keep the guns from properly reacting to the German preparations for the attack. AFter the five hour bombardment the German guns fired a 5 minute hurricane barrage of just high explosvie shells and then, there was silence as they prepared for the creeping barrage. On the British side, the barrage was hell, but did it actually accomplish anything? From a physical perspective the Germans had managed to take out most of the British front line wire, blow in many front line trenches, and destroy some of their defenses, but it did not destroy very many defenses in the Battle Zone, but it was not meant to. One area where it did have great effect was in cutting communication wires. The British buried these cables 6 feet under ground but even this was not enough and many were cut by the bobmardment. This was especially problematic around headquarters and between the front lines and the artillery. Since many areas would soon find themselves without a way to communicate with the rest of the defenders they were easily cut off, which fell perfectly into the German plan of infiltration by the assault troops. From a casualty perspective the numbers were actually quite light with only about 2,500 men killed and around 6,000 wounded. Although as always with these numbers those figures are a bit squishy since it is hard to tell who precisely was a casualty due to the artillery as opposed to a casualty caused by the opening phases of the infantry assault. From the front line the view of the artillery depended on if you were German or British. Here is Leutenant Rudolf Hoffman from the German 463rd Regiment "We could see the flashes of guns behind us but could see little in front because of the thick fog. If you put your hands over your ears and then drum your fingers vigorously on the back of your head, then you get some idea of what the drumfire sounded like to us." On the opposite side on the line was Captain Geoffry Lawrence of the 9th Scottish division "First a shell blew one door in and then the other near me. The candles went out, and we groped for our gas-helmets in the dark. Splinters of metal were making sparks as they fell through just above us, and the din was quite indescribably. Soon amongst the high-explosive shells falling alla round we heard the unmistakable plot, plop as gas-shells fell mexed with the others, and the burnt-potato or onion small warned us it was time to put on our gas helmets." Finally, here is Private E. Atkinson of the 1st West Yorks "Artillery was the great leveller. Nobody could stand more than three hours of sustained shelling before they start falling sleepy and numb. You’re hammered after three hours and you’re there for the picking when he comes over. It’s a bit like being under an anaesthetic; you can’t put a lot of resistance up. The first to be affected were the young ones who’d just come out. They would go to one of the older ones – older in service that is – and maybe even cuddle up to him and start crying. An old soldier could be a great comfort to a young one. On the other fronts that I had been on, there had been so much of our artillery that, whenever Gerry opened up like that, our artillery retaliated and gradually quietened him down but there was no retaliation this time. He had a free do at us. I think we were sacrificed." The only thing worse than the artillery was what came next. The stormtroopers were coming.